Habanero Peppers add economical heat to dishes. With the high cost of everything these days, any place you can save a few bucks is a good place to go. 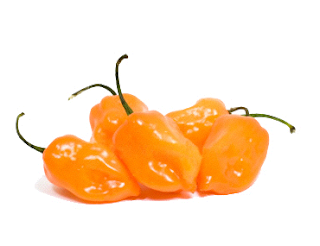 The next time you want a little extra heat in your food, look for the bright orange Habanero peppers. Watch out, cooking with Habanero peppers is economical, spicy and dangerous. I love food that has a kick to it. I regularly use yellow Hungarian hot peppers or Jalapeno peppers in dishes that I cook. But pound for pound, those peppers are getting expensive. Where I shop, all of the peppers are $3.99/pound. I make a large kettle of rice or pasta on a weekly basis and want it to have some heat. Using the Hungarian peppers provides heat, if you use enough of them. The same applies to the Jalapeno peppers. Habanero peppers are tiny and just a few will pack more punch than a pound of the other two peppers. The heat in peppers is rated on the Scoville Scale. Jalapeno peppers and Tabasco have a rating of about 2,500 to 8,000 Scoville Heat Units (SHU). Hungarian peppers are slightly less piquant. Habanero peppers have a rating of 100,000 to 580,000 SHU. Police grade pepper spray is around 5,000,000 SHU. For pennies, you can add a few Habaneros to a dish and get lots of fire. But be careful when you are preparing the peppers. In all peppers, the seeds and veins of the peppers contain the majority of the heat. You can remove the seeds and veins to tame a pepper down - but we're looking for economical heat here - so leave them in. If you have very delicate skin, you may consider wearing surgical latex gloves when cutting up Habanero peppers. If you do not wear protection, make sure you thoroughly wash your hands for several minutes with warm water and soap after handling chopped Habanero peppers. A quick splash and rinse will not remove the oils from your skin. Heat from peppers tends to increase the longer they are cooked. It will permeate the dish with more intensity as time goes on, too. Even though my concoctions are a bit dangerous to prepare, everyone that loves heat loves these dishes. I've used Habaneros in a dish I prepare that is brown rice, onions, garlic, Habaneros, lemon zest and juice, white Hominy, peas, yellow corn, cumin, oregano, salt and pepper. It's fabulous. I've also used the Habaneros with my basic red sauce - Large can of tomato sauce, large can of tomato puree, one or two cans of tomato paste, garlic, onions, oregano, basil, rosemary, salt and pepper. Add a can of water for each can of tomato products you put in the pot. Simmer uncovered for 30 minutes or more. Oh, is this good. Thanks for the pepper tips!